After I manually imported a few hotfixes and optional updates from Microsoft Update Catalog, I noticed that it takes quite times to download from Microsoft website. Is there any way to check the download status so you know when to expect they will be available to be deployed? 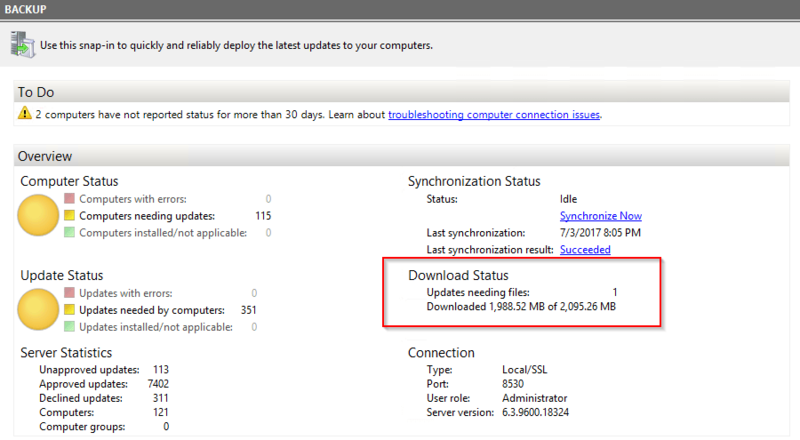 The bad news is that there is no way to check download status for individual updates but the good news, you can see the overall status right from WSUS console. Open WSUS console and click the server name. In the Overview section, you will see a section called Download Status in where it lists how many update files are downloading, how much has been downloaded and how much in total that needs to be downloaded. That’s actually enough for me.